Are you looking for a hip hop DJ for your next event? Either a wedding ceremony or any special occasion, Dj events is the biggest part of your party aside from the food and beverage. Why? Because you want people having fun and you are planning to have a specific genre of music at your event. A DJ has a large a presence in your party because he has to entertain the crowd and your guests. If you want to hire a professional and experienced wedding DJ, Sean Garrity Events and Production can help! We have an extensive library of mixed music, and if you like hip hop, we have experience with old school hip hop, new school hip hop, golden hip hop and have mixtapes available for you to choose from. Have fun planning other parts of your special day, because we will take care of the music. We offer professional wedding and corporate DJ services, and we come prepared and equipped with our light show if that’s what you previously requested. We also provide dance entertainment, photo booth rental, and any special request. You dreamed it; we make it come true! The most determining factor should be experience, experience, and experience. There is a flow to different types of events and ceremonies that our professional DJ is familiar with. A block party, bachelor party, sweet 16 and weddings are traditional events, which our DJ will host and emcee to keep your reception moving. 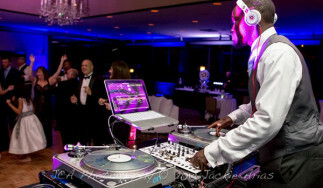 If somethings goes wrong in your event your guests will never know as our DJ will kept them entertained. DJ Sean Garrity has been a DJ for more than 15 years, and his experienced as a Radio Personality, artistic, and enthusiastic charisma keeps him in touch with his clients before, during and after the event. He has rocked all types of DJ events, including kids’ parties, corporate functions, theme parties, clubs, weddings, private functions & product launches. His skills bring passion to every event, and he will work hard to ensure that everything is to your specifications. Call us today at 954-464-5900 for any more questions and request a quote. This includes free consultation and no set up or take down fees! Contact Us Now.